Looking for a delicious salad recipe that is perfect for a healthy lunch or appetizer? Try out our Quinoa salad recipe with radish! The nutty goodness of the Quinoa mixed with the crunch of the radish makes it the perfect on-the-go lunch or ideal start to a delicious meal. We’ve shared some affiliate links to help you shop for ingredients. The first time I tried Quinoa was a few months ago with the Quinoa salad, asparagus and goat cheese! My husband and I loved it! We found it was a great lunch recipe: quick and easy! It’s filling. The kids didn’t enjoy it much because they don’t like goat cheese! They liked the quinoa though! So I started looking for a new spin to this salad. After all I had a half bag of quinoa that I needed to use. I don’t like wasting food! 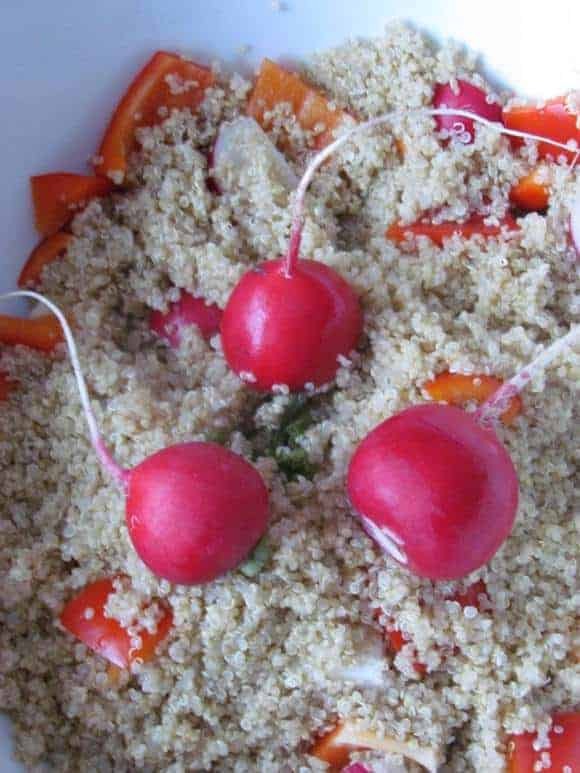 I stumbled on this new easy healthy recipe: quinoa salad with radish! I got from a special magazine: La Boite a lunch (or lunch box). It’s a Quebec published magazine where they feature easy healthy lunch recipes! Besides it was on sale for .99C . A bargain! The original recipe called for lots of ingredients! Do you know that I have a rule: if a recipe calls for more than 6 or 7 ingredients: either I don’t cook it or I put my spin on it! I usually put my spin on it! Verdict: perfect recipe for your lunch boxes! The kids enjoyed it more this time! It can be saved few days in the fridge. You can even separate it in small lunch box container so you grab it in the morning on your way out! Do you have a favorite Quinoa salad recipe? We’d love to hear about it! Or perhaps another way to prepare this unique, delicious grain? Should You Considering Using a Midwife During Your Pregnancy & Delivery? I’ve never tried Quinoa, but this salad looks so yummy! Thank you for sharing with us, I’ll have to look for Quinoa when i’m out again! I have been wanting to try Quinoa, but haven’t really seen any recipes to make it. Thanks for the post and great recipe. I have been thinking of trying quinoa as a substitute for rice or pasta in my homemade soups (beef barley or chicken soup). Your salad sounds yummy except I don’t like goat cheese. I’m thinking of trying it with mozzarella cheese. I am not a big fan of quinoa but I am always looking for new recipes that use quinoa. I think I might like the salad and I am going to try it. This recipe sounds really interesting, although I don’t really care for radishes. What a great recipe! I never thought to put radishes in my quinoa. I know Quinoa is good for you so I try many different recipes to find something I like. I will try this. I was just talking about quinoa last night. On my own for 7 days and I will try this. I also have to do GF free for events and I would love to try this in a lettuce wrap. I really like quinoa. I prepare it with a little salad dressing and some tomatoes and it’s delicious. this looks yummy! saving to try later! This looks amazing, I have only recently started eating quinoa! Thanks for the recipe! mmmm Quinoa is delicious! I made a greek quionoa salad the other day but this looks good too! I am personally not a huge quinoa fan but I do make small amounts of it (lol) for my boyfriend because he loves it. I will give this recipe a try! Omg this looks so yummy!!!! I wish I liked quinoa but it grosses me out so I think I’ll try this recipe but with couscous instead! Yummm! I love quinoa. I’m not a fan of radishes, but I think it would still taste great without. I think I will try it! I’m always looking for a good quinoa recipe. The radishes just may provide that contrast in taste that could prove very tasty! But I’ll have to try it out just to make sure! That’s a very healthy dish to prepare and serve. I haven’t eaten quinoa yet. It doesn’t sound too bad. I think I would like it with the pumpkin seeds too. 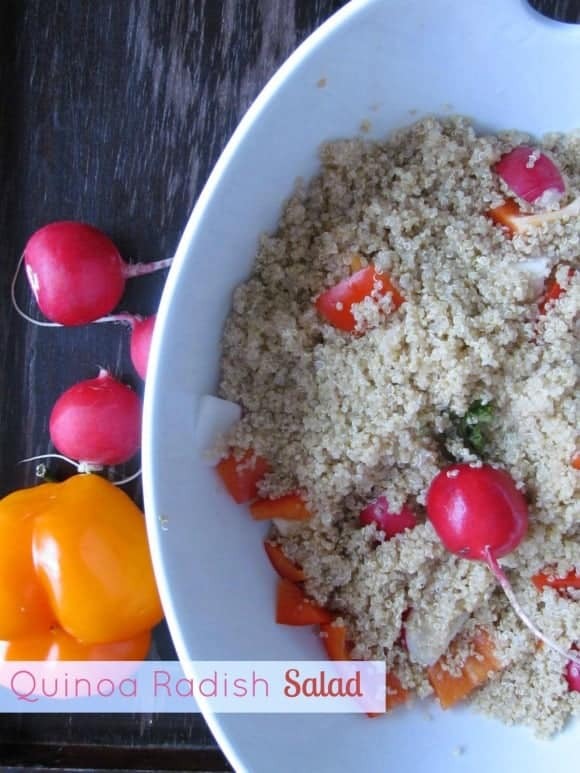 I love quinoa as well as radishes so this sounds like the perfect salad for me! Can’t wait to try it! Yummy. I like quinoa. Looks good. This looks so good! I love quinoa, but Im not sure about those radishes! We love Quinoa, a great ancient grain high in protein. Can’t say I like the radishes though! Thank you for sharing the recipe. It looks good. I do like quinoa. We are just getting into quinoa here and it’s delicious! I grow a lot of radish’s in the spring so I have to save this to pinterest so I do not forget to try this! Oh yum! Quinoa is a staple in my household so new, delicious recipes are always welcome. Thank you! I should try this, I’ve actually never tried Quinoa before. I have never tried this. Looks tasty! I pinned to give it a try. This sounds delicious! I love quinoa! Yum! I love quinoa! It’s so healthy for you! I’d try it. We’re big fans of quinoa here. My son and his wife are big fans too, so I’ll pass the link along to them. Looks like a great recipe. I have been wanting to try Quinoa. Camping Three Ways: A City Girl Learns to Camp! Is Racist Bullying A Hate Crime? Spring Cleaning Essentials: What Do You REALLY Need? 5 Must Visit White Sand Beaches in the U.S.